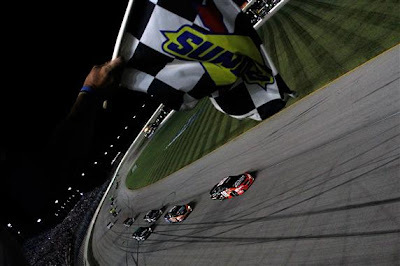 JOLIET, Ill. (July 9, 2010) — Kyle Busch beat Joe Gibbs Racing teammate Joey Logano in a green-white-checkered-flag finish to win Friday night’s Dollar General 300 NASCAR Nationwide Series race at Chicagoland Speedway. Busch got a break when series points leader Brad Keselowski ran out of fuel on the final caution lap before the last green-flag run, which began with a restart on Lap 202. Keselowski’s misfortune allowed Busch to move to the front of the outside line, beside his teammate. 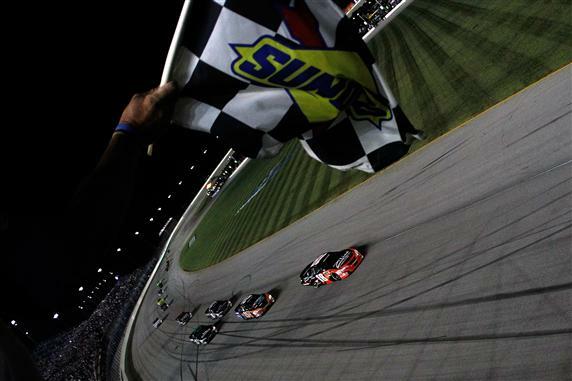 Busch was able to pin Logano to the bottom of the track and clear his teammate for the win. The race ended under caution because of a wreck on the frontstretch after Busch took the while flag to begin the final lap. The victory was Busch’s seventh of the season and 37th all time, breaking a tie for second with Kevin Harvick on the all-time list. Braun Racing’s Brian Scott, David Reutimann and Jason Leffler finished third through fifth, respectively, as Toyotas swept the top five positions. Danica Patrick finished a career-best 24th in her fifth series start. Busch, who led a race-high 110 laps, took the lead for the first time on Lap 10 and dominated the race—despite a pit-road speeding call that required a pass-through penalty under green—until NASCAR threw a caution for debris in Turn 2 on Lap 141. As it turned out, Busch was wrong. NASCAR called a caution for debris on Lap 185, and Busch pitted for four tires and a track bar adjustment designed to loosen the handling of his Toyota. He got his chance to win the race when Trevor Bayne slammed the Turn 1 wall on Lap 196.